I happily responded because I've never had a ton of money to invest on these things either but I think I've come up with an arsenal of basics that serves me well. And I thought there might be more people like us out there who might like to know too so I created this post. You don’t need $300 blenders or 47 different knives to be a good cook. And I’m kinda proof of that. But there are a few things I rely on time and time again I think everyone should have. If you’re setting up house for the first time, wanting to become a better cook or thinking of bridal shower ideas, here’s my list of the Top 20 things you need in your kitchen. Also, it's worth mentioning I pick up a lot of stuff at stores like Home Goods, Ross, TJ Maxx and Marshalls. It's a good way to get high quality stuff (omelette pans, spring form pans, etc.) on the cheap and you can buy little gizmos or specialty ingredients you wouldn't normally spend the money on. I'm IN LOVE with vanilla bean paste (to use instead of vanilla extract) and can usually find it at one of these stores for next to nothing. 1) A good, basic set of pots and pans. Mama still has the same set of Revere Ware she’s had since 1969 and I still have the set she bought me over 10 years ago. It doesn't have to be Revere Ware but you need to look for a set that has nice, thick, level bottoms and no non-stick coatings or complicated, fancy handles or lids (more stuff to break over time). For the money, I’d buy Revere Ware. It’s what I plan on buying my girls when they’re ready to set up house. You can cook anything from pancakes to fried chicken in a 12-inch skillet and you need one with a fitted lid so you can cook dishes like Skillet Lasagna to Smothered Salisbury Steak (and a gozillion other dishes – search “skillet” in the recipe search field down below on the right side bar). Spend some money on these and forget all the other fancy one-function-only specialty knives. The Victorinox knives have always served me well (they're made by Swiss Army). Don’t fool around with the plastic ones and don’t be tempted to buy over-sized ones. You need something footed that will last and easily fit in your dishwasher. A small one for easy tasks like mincing or smashing garlic, a medium one for chopping vegetables and large one for carving meat. I use my cutting boards for serving also. When I’m setting out munchies I almost always use my cutting boards to arrange fruits and veggies or to create a cheese board. These can also be used as a trivet to protect your table or counters from hot dishes and pans. You’re going to need an assortment of sturdy wooden spoons, a big slotted spoon, a whisk, a heavy duty metal spatula, a soft spatula for using with non-stick pans and a vegetable peeler. You’ll need these for everything from cakes to casseroles and you can never have enough. Buy the clear glass ones as the tinted ones will shade your masterpieces whatever color they’re tinted. You don’t want your Smothered Chicken to look blue, do you? And go ahead and get one with a lid - you'll use it more than you think. Because face it, sometimes you’re just going to cook frozen fries and fish sticks. And you’re also going to need these to roast vegetables, bake oven-barbequed chicken legs, make cookies and everything else under the sun. I am in love with crank-style nut grinders. I still have the one from my Nanny’s kitchen and Lord knows how old it is. This style produces the perfect consistency chopped nuts. This little investment is worth its weight in gold. Making cookies, cake balls, truffles, etc. gets a whole lot easier when you can just scoop and drop. And the best part is you don’t have to worry about uniformity – everything will be the exact same size without all the eyeballing and adjusting you usually have to do. I also use mine to portion out batter for cupcakes which means even-sized cupcakes and no mess. Buy an assortment of these for scraping down bowls, folding whipped recipes and hand-mixing. My favorite thing about these is that you can practically clean a mixing bowl with one which means there’s no waste and much less mess to clean. You will use these for the obvious tasks like adding barbeque sauce and basting your meatloaf but these also make quick work of buttering or greasing pans and baking dishes (and turkeys!) without the usual mess. If you can afford a Kitchenaid, then go for it. It’s worth it. If my house ever catches on fire, my fire-engine-red Kitchenaid is going out with the kids. But if you can’t afford a Kitchenaid, Sunbeam and other manufacturers make good ones too. I started with a $20 Sunbeam from K-Mart years ago. If you've been around here with me long, you know liquid and dry measuring cups are not the same. You need a good set of both the scoop-style (dry) and pitcher-style (liquid). You’re also going to need a sturdy, accurate set of measuring spoons. And if you've been here long you know my stance on shredding your own cheese – just do it! You just need a sturdy box grater. Don’t fool around with all the jazzy ones out there – just get one like your grandma had. You don’t have to spend a ton of money on a food processor but it does need to be big enough to get through the task at hand without having to use it in batches. I have a cheap-o 8-cup Black & Decker model and it hasn't let me down yet. Choose 8-inch or 9-inch just make sure they’re the same and both heavy and of good quality. Thin, cheap ones warp and dent easily over time which makes for uneven cakes. A small one for dusting paprika on deviled eggs or powdered sugar on desserts and a large one for sifting flour, straining stock or to use as a colander. You don't need some fancy high-dollar sifter, just a simple mesh strainer. Buy one that functions as both (not just a microplane) and you’ll be able to use it for anything from lemons to parmesan to nutmeg. You’ll be surprised how much you like citrus zest once you have a tool to easily make use of it. Any time I need to add citrus juice to something, I go ahead and throw some zest in there too for a little extra pop of flavor. The thing I do most with my kitchen shears is to cut that white tendon thingy off of chicken tenders because they skeeve me out. But they’re also great for cutting herbs. You will be shocked how often you use kitchen shears once you have some. Your list is great and I agree with it -- when we travel I take my ceramic knife with me -- it is so sharp and I can cut lettuce without it turning. Also it is a luxury but I love it -- our immersion blender and I got a Griswold iron skillet off of ebay and I love it. We re-seasoned it and it works beautifully. I love your site, I am new to it, I love to cook, I had everything to cook with, 9/04/11 we lost everything we owned in a forest fire, we had 3 minutes to get out, we are older and I miss all the things I had. Thanks for reminding me of some of the things. When I can afford them I will get them. Thank you for your site,I love it! This is a good list. My cookware is all cast iron (and ancient!) but I've never found a need for anything else (no non-stick here, my mother and grandmother would have a fit (originally from a Louisiana bayou in N.O. for the last 30 years and over 50)). My knives are hand-me-downs from my mom and grandma and I use a wet stone to keep them sharp (which I would recommend but I've discovered only the boy scouts still encourage using one). I don't bake but I do appear to be addicted to wooden cutting boards, wooden spoons and whisks. Go figure. You are awesome! Ceramic knife sets are always good to have because of their sharp feature. I have one which is with me in my kitchen as well as when I am out somewhere. They are easy cut anything without making any mess. 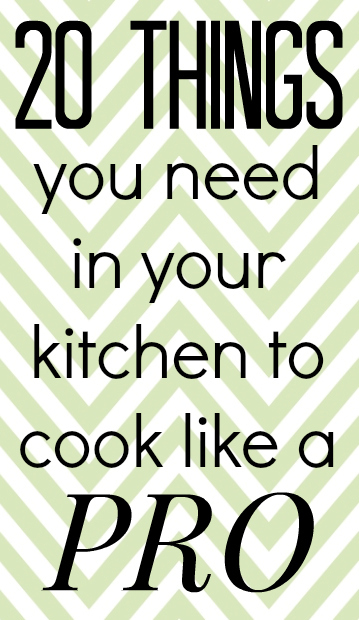 I'd add a 3rd cookie sheet to that list. Two is good for chicken nuggets and french fries, but a third one is good for baking cookies -- you have one in the oven, one cooling, and one loaded up and ready to go. And 2 12-cup muffin tins. Muffins, mini-meatloaves, mini-quiche, and cupcakes! I do believe that kitchen knives are essential for every modular kitchen. I have some Victorinox India kitchen knives which could be perfect for kitchen purposes. Excellent post. Thanks for sharing such a useful post. LOL!! I have the cheap-o 8 cup B&D food processor, too. I think it is at least 10 - 12 years old and it has never let me down, either, and I use it....A LOT! I am sure I only paid $20-25 for it cause I am a cheap-o and wait till things go on sale (I have a budget ya know!). I also have a little $5 2 cup chopper that I use a lot as well. LOVE your site! Born and raised in Gawga, moved to Texas many moons ago and am now living the high life in Cali up in the north mountains. Love your site and the recipes are spot on like Grandma's and Nannies!! Don't all Southerns have a Nannie? Thought so!